The Shiva Shanti I® is a 3 way hybrid which con- sists mostly a Afghani strain that we call Garlic Bud because of its aroma characteristic. 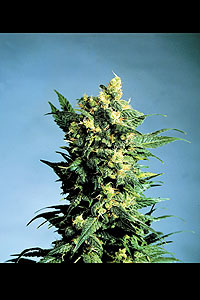 The Shiva Shanti II® contains a smaller proportion of this Garlic Bud and is added with Skunk and another Afghani. It is a less stable 4-way hybrid but quality-wise very nice.